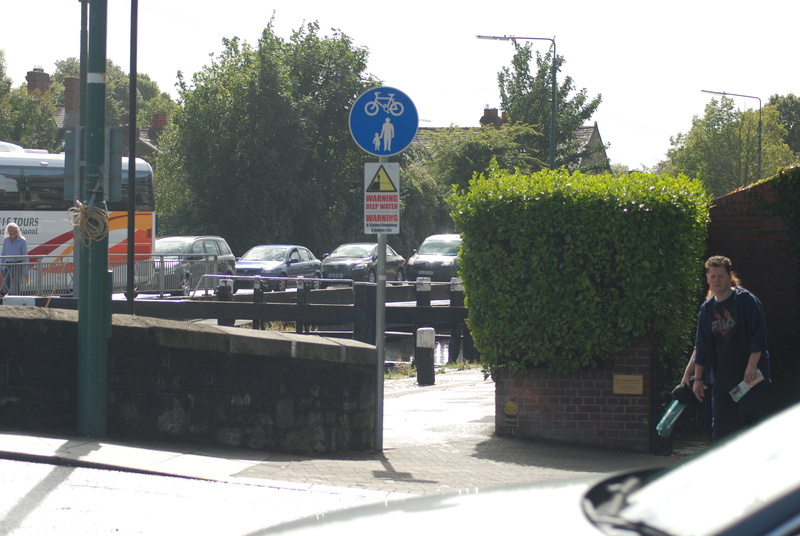 What to do with a problem like cycling at Leeson Street bridge? 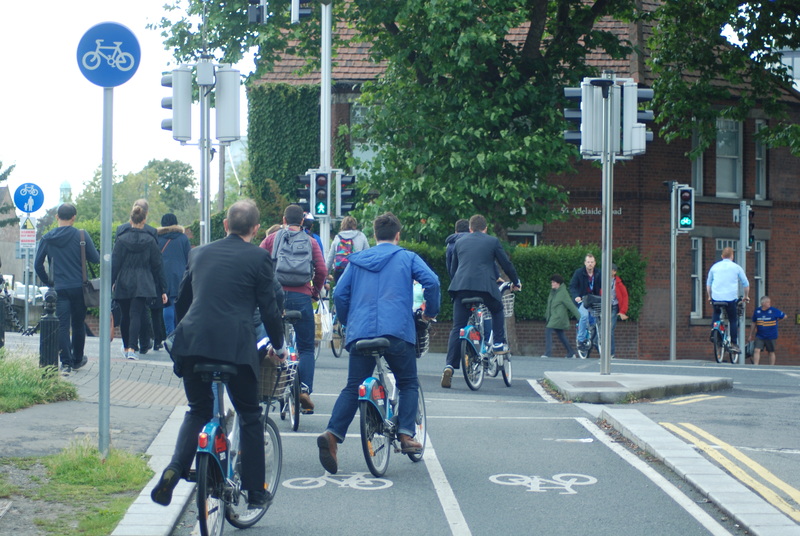 COMMENT & ANALYSIS: Cycling has boomed so much along the Grand Canal Cycle Route in Dublin that Census experts at the CSO linked the cycle route with a notable increase in cycling in areas beside it. But compromises when the route was built is adding to heavy congestion at peak times, lowering the potential of the route and its potential for expansion. 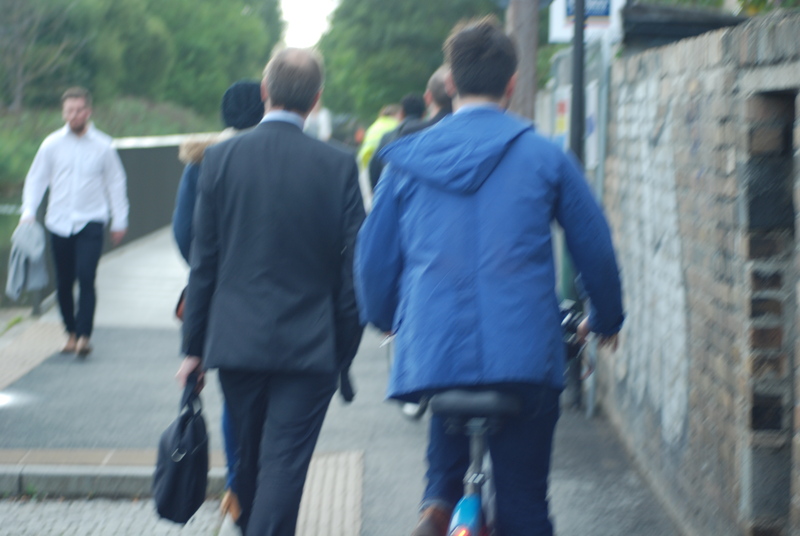 This is a small area but it messes with the capacity for both walking and cycling at peak times and results not just lower quality of service but also discomfort and safety issues. I’ve had people tell me the focus should be to expand the Grand Canal Route towards the west, but such an expansion will mean more people cycling at least to Leeson Street and making this pinch point worse. That means this issue should be looked at before or as part of the expansion. Upgrading of cycle routes with BusConnects, building the planned Fitzwilliam cycle route or just the general increase in cycling will also put presure on the pinch point. Leave the lock gate on the left in the open position and level off the surface (up or down) around the lock gate. 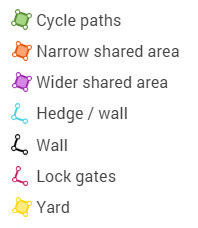 Look at different designs for the lock gate and see if this is possable within any protections and/or Waterways Ireland’s historic attitude towards cycling. 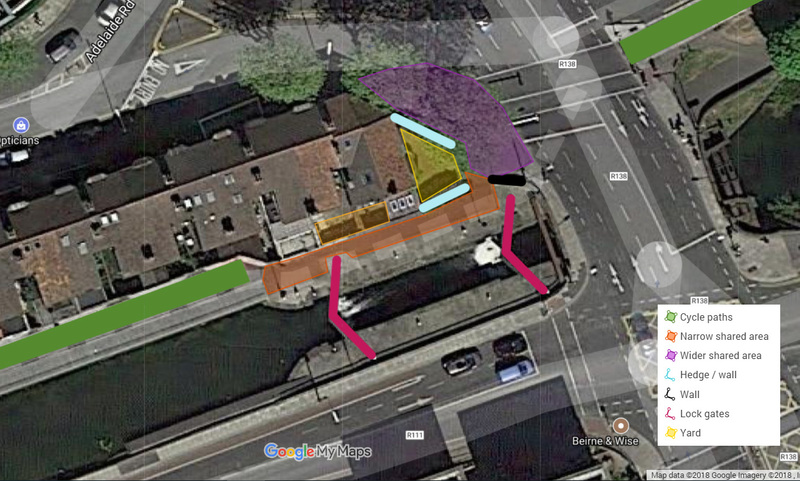 Remove a small section of wall (shown in black beside the purple area above) — this wall is not part of the bridge, which is possibly protected. Cut back the hedge besides the canal to increase visibility. CPO the part of the front yard / parking place (yellow). CPO the all of the front yard / parking place (yellow) to allow for a large waiting area. CPO part of the rear yards, the parts of the sheds and extensions which were built into the rear yards, and the front yard — this option is likely to cost too much to be justifiable but depending on the condition of the extensions (many similar ones are of poor quality), the owners might be open to the cost of upgrading a smaller space etc or just take compensation. CPO part of the rear yards, the parts of the sheds (but not the extensions which were built into the rear yards), and the front yard — this way the route could curve around buildings and the lock gate if it can’t be changed. Build a two-way cycle path on Adelaide Road (between Harcourt Terrace and Leeson Street) to fully re-route cycling or have it as a capacity enhancement. Build a shorter re-routing via 29-31 Adelaide Road (see below for details). I promised blue sky thinking — underpasses or overpasses are not suitable for this location given the canal, the historic bridges and the building etc but at least a few of the above are possable. 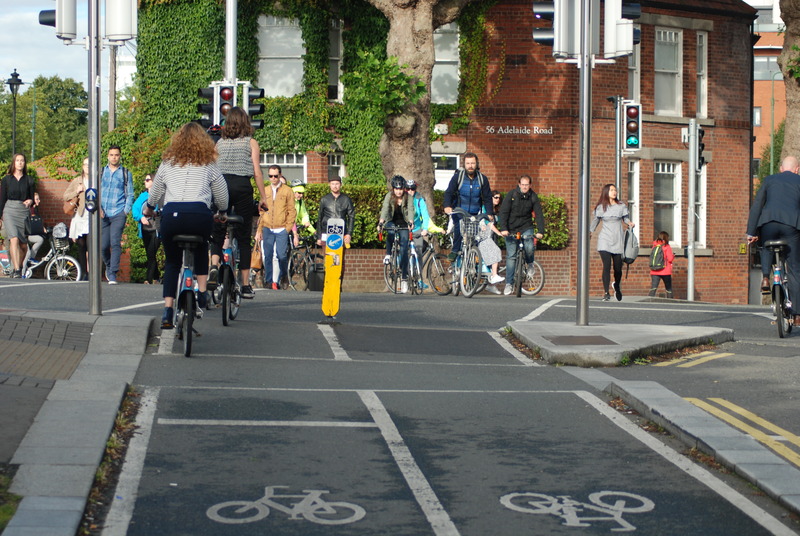 Are we likely to see any action to make one of Dublin’s better cycle routes better, safer and to be usable by more people? CORRECTION: This article originally stated that 29-31 Adelaide Road is owned by the OPW, this is not the case. It is only rented by the OPW on behalf of the Department of Communications, Climate Action and Environment. Because it is a privately-owned building, the details previously included in the article on routing the cycle route via this building — in the same vain of the cycle path inside the Rijksmuseum museum building in Amsterdam, was removed. IrishCycle.com apologises for this error. Regarding changes to the lock, it might be possible to make the arms shorter. 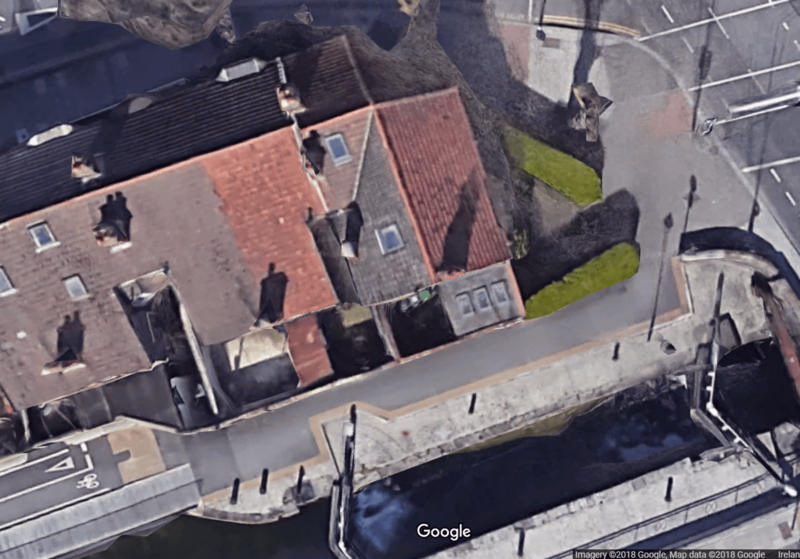 Take a look at the lock beside the Mount St Lower/Northumberland Road bridge. The lock gate right beside the bridge has really short arms – it looks like it uses some kind of winch system to supply leverage. The bit at the lock gate doesn’t bother me nearly as much as the corner. Forcing all the pedestrians and cyclists through the narrow gap with no separation at all and very restricted visibility is certainly in my top three bad points of this route. At least at the lock gate there is some notion of who should be where, even though there isn’t enough space, and you can see what is happening so you know what to do. It’s a nice illustration of transport priorities that this is all due to what seems to be a private parking space. If this had been a motorway instead of a cycle route that whole house would have been gone long ago and the only outrage would be that it had taken so long to do. Interesting point about the M9 and if the figures are that low are we paying compo to a private company as is the case with other PP partnership motorways ? Great article! I like the idea of re-routing the cycle lane through the DCCEA offices.